I am an mp3 whore. A song hoarder, and here’s a tip on how to do it. Fact1: If you have been in the web hosting business, you should know that most web servers have directory listings, and most n00b users forget to switch them off. If the web server happens to be just a file server, then its highly likely that the directory listing is on. Fact2: The listing is cached in Google’s index by the title of the page, which normally is Index of /blah blah blah. Eg- “Index of /” + mp3 + beatles + strawberry fields will lead you to at least one directory listing. A word of caution though, there are advertisers and spammers out there who know this as well, so 80% of the links turn out to be dead ends, but perseverance and determination gets you there. I am a last.fm user. Been an active user since March 2nd, 2008. For the uninitiated, what last.fm does is it stores my music plays and tastes and also recommends me music which I might like to listen, based on my tastes … collaborative filtering + social community. So, they have revamped their site design … added so many widgets (I had sported some on my blog) … now they are allowing this data to be accessed through API!! What this means that the gazillions of programmers out there can come out with their own version of add-ons for this application. What that means … is that there is a big pay load of data to be mined. 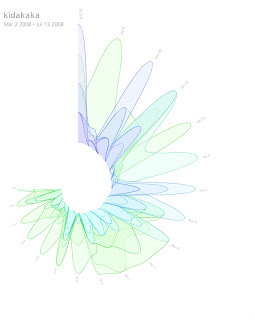 I saw this music spiral application for instance … it generates my music spiral (dont ask me what it is) … it looks pretty. Day before yesterday, I updated my Winamp … and normally I do not saunter around this software, I just listen to songs and be happy with that. That day, I was tinkering around with the Media Library, and saw this awesome AutoTag feature. Don’t you want to classify your ever growing music collection Artist-wise, Genre-wise, BPM-wise, Year-wise, Album-wise, so on and so forth? Won’t it be great if you could manage that? Believe me, I try but have never managed to do so, so many songs, just 10 fingers. I bet many of you would also face the same problem. ITunes has a facility of tagging the songs, but you need an IStore id, and that aint available in India. Bummer!! Worry nought!! GraceNote is here … its a firm bought over by Sony Inc. for $260 million sometime back. They have an online CDDB collection, for tagging your songs automatically. Winamp is integrated with that. Wooohooo!! What I mean to say is that when you are listening to a particular genre or an artiste, then do you feel the emotion of that song within you?? Sometimes I think that most of the bands which have shot to fame are not simply because they write good melodies or great lyrics … its because their target group can identify with the emotion underneath the song. Think about it in this way … a fan of Marilyn Manson, would most likely be wearing gothic makeup, would have had a troubled teenage life, feels unduly wronged … a fan of DJ Tiesto or Paul Oakenfield would love to dance to a good tune and definitely loves a smooth life … Linkin Park listeners would have a pent up frustration within themselves, occassionally wanting to shout out against the system. Or have I wrongly analysed the situation?